Amrit Chaudhuri, with a peptide synthesizer, often juggles a disparate set of roles as CEO at Mass Innovation Labs, an incubator of tech firms in Kendall Square. CAMBRIDGE — His formal title is chief executive of Mass Innovation Labs. 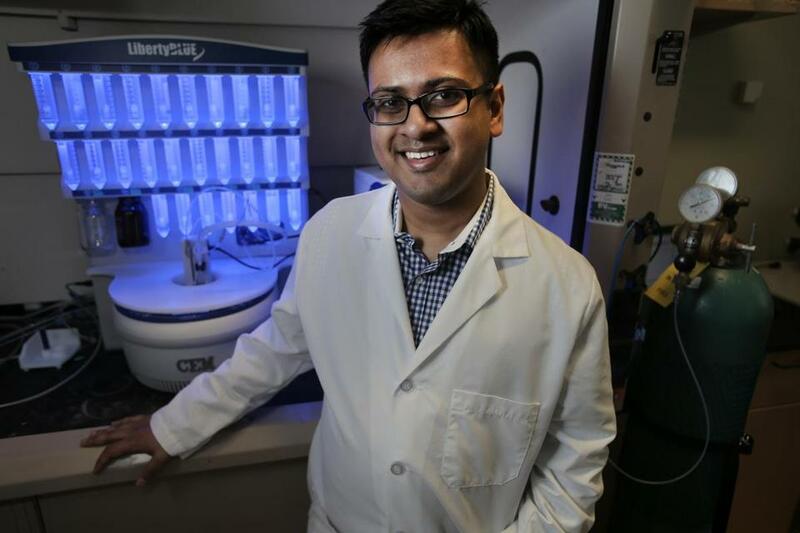 But on many days, Amrit Chaudhuri’s real job is hand-holder and troubleshooter for the 10 biotech companies housed in his incubator in the heart of Kendall Square. That means poring over floor designs, coordinating technology infrastructure, advising tenants on safety permits, and figuring out how to install bulky lab equipment. “I sit in on the janitorial meetings to make sure the cleaning is done properly and on the right schedule,” said the 30-year-old Chaudhuri. When a vendor recently dropped off a multimillion-dollar mass spectrometer for a tenant on the loading dock at 675 W. Kendall St., a week earlier than anticipated, Chaudhuri and his colleagues took delivery of the 1-ton piece of analytic equipment. Cofounded by Chaudhuri and two partners, chief financial officer Seth Taylor and chief operating officer PC Zhu, Mass Innovation Labs is still a relatively small outfit, with about 80 employees and contractors running the facility. But the founders have ambitious expansion plans, and Chaudhuri spends a chunk of his time talking to Boston-area biopharma companies about how his incubator can remove obstacles for them. “We want to help them engage in real estate during their swing time,” Chaudhuri said. “We want to understand their pain points. What are their needs now and where do they expect to be? And why are they planning a 15-year lease at another location when they don’t know what their needs are for the next five years? “These are the kind of conversations we have,” he said. Chaudhuri’s pitch is that his team can provide flexible accommodations and worry about building-related problems so its tenants can concentrate on drug discovery. It’s important to understand the life sciences work flow and the furniture and lab benches it requires. While all the companies in the incubator can share the main systems, each needs separate information technology and Wi-Fi networks. That is especially important as some tenants are also competitors in the biotech industry. “We basically build a private network for each company,” Chaudhuri said.